It is a great beach between the Baleal Island and Lagido surf spot. Around here you will find everything you need for a good surfing day. Nice scenery, possibility to walk around, lots of beach bars with cool atmosphere and snacks to charge your energy after the surf session. If you need surf lessons or surf material there are many surf schools and renting possibilities in Baleal. Next to Prainha is a big parking place, which is usually full of surfer’s cars and vans. This is a place with lively atmosphere all the time. There is also a shower available next to the beach. There are very consistent waves, which are good for beginners as well as all levels of surf. Prainha has right and left hand waves. There is a sandy bottom, but be careful about few stones in the middle of the beach. 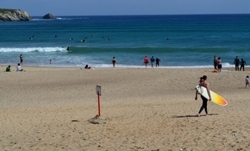 Mainly in the summer it can be crowded and there are lots of surf schools from Baleal having surf lessons. This is a favorable surf spot to catch your first waves. The best wind to Prainha blows from the south and the east. Combined with the west or the north swell, you are going to have lots of fun with these waves. It is working at all tides, but the best might be at the half-tide. 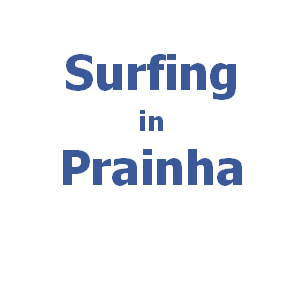 It is possible to enjoy surfing at Prainha all year long. Surfing in Portugal is great, join us and enjoy your Portuguese surfing. Do you need surf help? Contact us by info@SurfingInPortugal.com.